Fasolada or fasoulada (φασολάδα or φασουλάδα, sometimes written fassolada or fassoulada) is a Greek soup of dry white beans, olive oil, and vegetables, sometimes called the "national food of the Greeks". 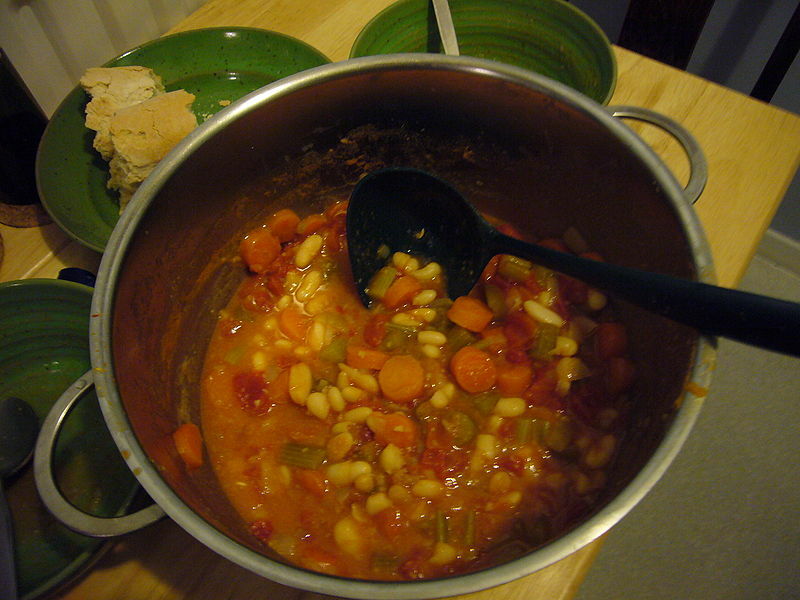 Left: Fassoulada (Greek bean stew). The Middle-Eastern version is called fasoulia. The term is used for various white bean dishes in Egypt and the Levant, as well as in Turkey and Cyprus. The soup is similar to tomato soup; it is made by boiling tomato sauce with water, beans, and vegetables. Ingredients vary, but may include carrots, tomatoes, onion, parsley, celery, and bay leaf; lima beans are sometimes also used. The vegetables are mixed in and brought to the boil gradually. Each region has its own recipe.